Normally we need to add a 220 Ohm resistor with LED for Arduino dev boards and similar works. Not only making that on breadboard wastes time, but also it takes time to either check the value of resistor manually or using a multimeter. The thing we made looks great and quite useful for day to day electronics development works for simple “plug and plan”. We saw the idea somewhere and recreated it to share with our readers. If We Solder LED With Resistor Directly With Male Headers They Become Ready to Use LED For Breadboard With Male Headers For Arduino, Pi Projects. We used blue color LED which is clear and a 220 Ohm resistor. Not all color and size of LED needs exactly same value of resistor – in our one old guide we discussed about color of LED and approximate resistor value. Of course, some experience of soldering needed. Those who can nor nicely solder, can use basic wire wrapping like method by twisting semi-rigid wires at the junction points. Although it looks crazy interesting, this is the basic behind invention of various shields for development boards. You can become creative around the basic electronic components and invent more such plug-n-play basic electronic components. Arduino UNO has a GND just beside the Digital Pin 13 for easy work. Basic Blink example of official Arduino actually look like this. For creating bulk number of similar LEDs, you can take some PCB services who mounts components on board for a fees. Creating one such LED consumes quite good energy and concentration. On professional hand, the work will be more neat. If you create a row with multiple LEDs, then you probably female headers to make the GND common. This cheating method does not work with components like LDR as you will need one 5V supply and one Digital pin. In that case, you can create a half-size shield to be mounted on Arduino UNO. The easy thing becomes complex quite easily. This Article Has Been Shared 2053 Times! 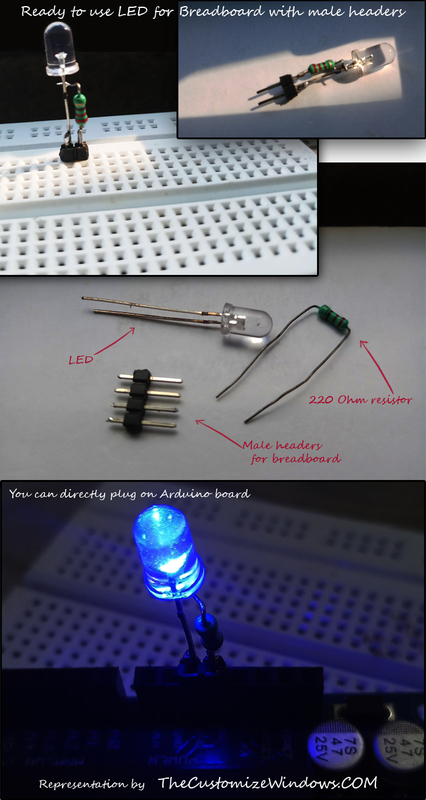 Cite this article as: Abhishek Ghosh, "Ready to Use LED For Breadboard With Male Headers (Arduino, Pi)," in The Customize Windows, May 12, 2018, April 23, 2019, https://thecustomizewindows.com/2018/05/ready-to-use-led-for-breadboard-with-male-headers-arduino-pi/.